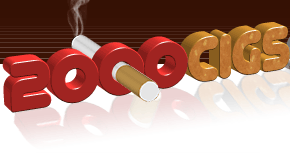 A.: 2000CIGS.com provides an efficient and easy way to place orders on our website. A.: Orders can be placed confidentially by FAX. Please contact us at support@2000cigs.com to receive an "Order by FAX" form. A.: We 100% guarantee delivery. In case you are not satisfied with the purchased product or your parcel is lost, stolen or damaged you should e-mail your inquiry to support@2000cigs.com. Please refer to our "Shipping and Delivery Policy" and "Refund Policy" pages for more information. To make certain that you receive our replies to your email, please add our email addresses (support@2000cigs.com) to your list of contacts/address book/safe list. If you have installed a SPAM filter, then check the settings and its folders to verify that it hasn't prevented you from seeing the reply. If it moves the email to a different folder, scan through that folder looking for our reply. If you do not receive replies after repeated attempts to contact us try reaching us from another email address, or inform us that you are not receiving our replies and perhaps we can try sending an e-mail from a different address.